A new era of Doctor Who has begun! It has been a couple of days since the BBC Global Simulcast of S11E1 “The Woman Who Fell To Earth,” but we can’t stop thinking about it. So many great things happened! I was a bit nervous at first but after watching the entire 2-hour premiere in full, I can confidently say that all of those nerves have calmed down. Welcome back, Doctor Who. Welcome back. Do not under estimate Jodie Whittaker’s Doctor just because she’s a woman. She doesn’t quite remember who she is yet (for obvious reasons), but when she does, it’s full throttle from there. 13 has great energy. Graham O’Brien: Graham is a former bus driver, Grace’s second husband, and Ryan’s step-granddad. He’s very suspicious of everything at first but ends up being a part of the team. He wants to get along with Ryan. Grace was his chemo nurse. They have been married for three years. Grace: Grace is a chemo nurse, Graham’s wife, and Ryan’s grandmother (aka Nan). She’s the core of their family and took her grandson in after his mother died and dad left. She has an adventurous spirit and probably is one of the most kind-hearted souls you’ll ever meet. Karl Wright: Karl was on the train with Graham and Grace when the Gathering Coil appeared. He is a crane operator for Skylark Building Services and ends up being the human trophy Tzim-Sha is looking for. Rahul: Discovered the new alien the first time it came down and has been on a mission to avenge his sister Asha ever since she was taken from them. He leaves a video for the group after it kills him. Ryan Sinclair: Ryan is a 19 year-old warehouse worker who wants to be a mechanic. He’s the first one to discover signs of trouble when he looks for his bike in the forest. We later learn that Ryan has dyspraxia. He also has a YouTube channel. Yasmin Khan (Yas): Yas is a second-year probationer at Hallamshire Police. She’s tired of traffic disputes so she asks her supervisor if another assignment has come in. She’s the one who ends up answering Ryan’s call. They both went to the same Redlands Primary together. Tzim-Sha (“Tim Shaw”): Tzim-Sha is a Stenza warrior on a mission to find the human trophy so he can go back to his home planet and become its next leader. The Gathering Coil is his tool. 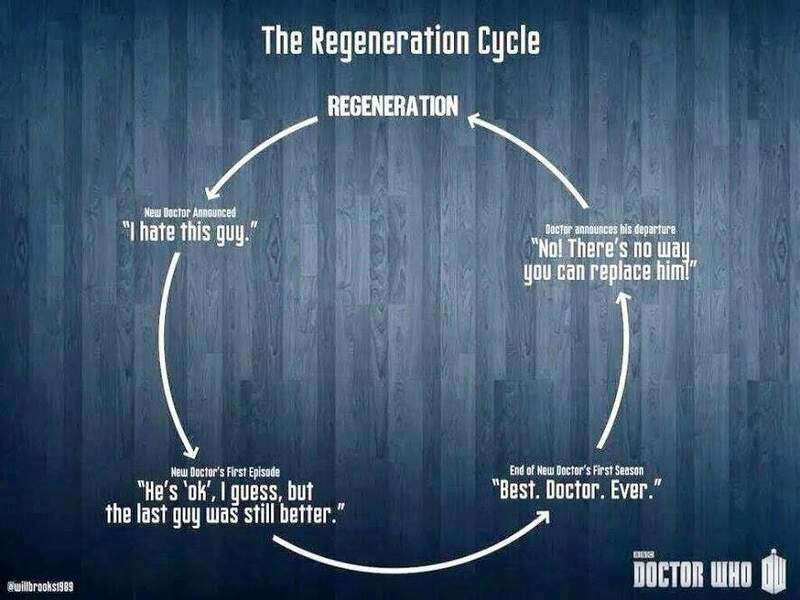 This was one of the best regeneration episodes I have ever seen. When news broke that 13 was going to be the show’s first female doctor, the fandom naturally freaked out. But if there’s anything this show has taught us, it’s to embrace change. That’s what it’s all about. We’re going to see and experience changes whether we like it or not. Take a look at this info graph. You’re probably somewhere in between “I hate this person” and “They’re okay, I guess,” right? It’s okay to be uncertain of change but give it a chance. Keep going. I didn’t want to write a review because it’s too early to form a decent opinion on the show’s new direction. A lot of things may seem weird right now, but that’s what makes this so exciting. Let’s be honest, our show has been dying off for a while. This might be the saving grace we need. What are some of the things you’re looking forward to about the new series? Leave your thoughts in the comments below! That infographic has all male pronouns and I sideeye it (not your fault, I blame the bbc lol), but I’m already at the Best. Doctor. Ever. stage. I rewrote it in my paragraph above it because that was bothering me too and same. lol.